This aircraft apparently had 2 or more control rotors but it is not clear how they were configured and what their exact purpose was. The original configuration also included secondary rotors to cool the engine but these were deemed ineffective. de Bothezat's patent for the machine is US Patent 1,573,228. Resources related to the 1922 Helicopter, provided by the Vertical Flight Society. 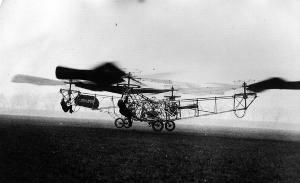 Resources related to the 1922 Helicopter, provided by public sources across the internet.